Since Friday, we've been warning of the flood threat in the East for this week. The deep magentas are flash flood warnings. The dark greens are flash flood watches, The lighter greens are various flood warnings. 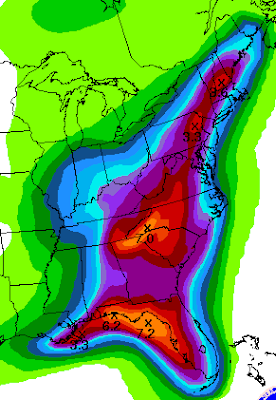 Here is the 5-Day Rainfall Forecast starting at 8pm EDT this evening As much as seven inches are forecast in the western Carolinas. 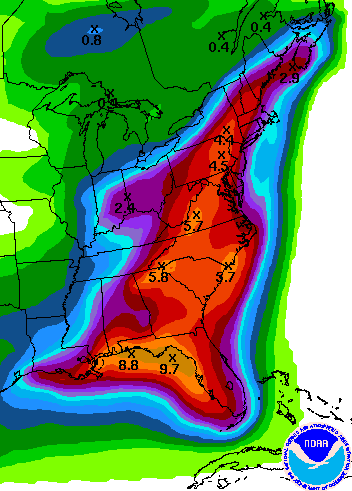 Given the level of soil saturation in many areas, it is important you keep up on the latest forecasts and advisories. The U.S. and its private sector partners will initially focus its efforts on six African countries: Ethiopia, Ghana, Kenya, Liberia, Nigeria, and Tanzania, where Obama will wrap up his trip later this week. Former President George W. Bush, who supports health programs throughout the continent, will also be in Tanzania next week, and the White House did not rule out the possibility that the two men might meet. Obama will also highlight U.S. efforts to bolster access to food and health programs on the continent. His advisers said the president sees reducing the poverty and illness that plague many parts of Africa as an extension of Mandela's example of how change can happen within countries. Private companies, including General Electric and Symbion Power, are making an additional $9 billion in commitments with the goal of providing power to millions of Africans crippled by a lack of electricity. Having now read the Reuters and Fox versions of the story, neither explains what type of power generation is planned: Coal, hydroelectric, natural gas, nuclear? Regardless, this is good news. Great New Amazon Web Page for "Warnings"
Given the fact that soils are saturated over most of this region, these heavy rains will lead to serious flooding as the week goes on. Stay tuned. And, Wind Power is a Good Thing Because? And, this is way too much heat today. 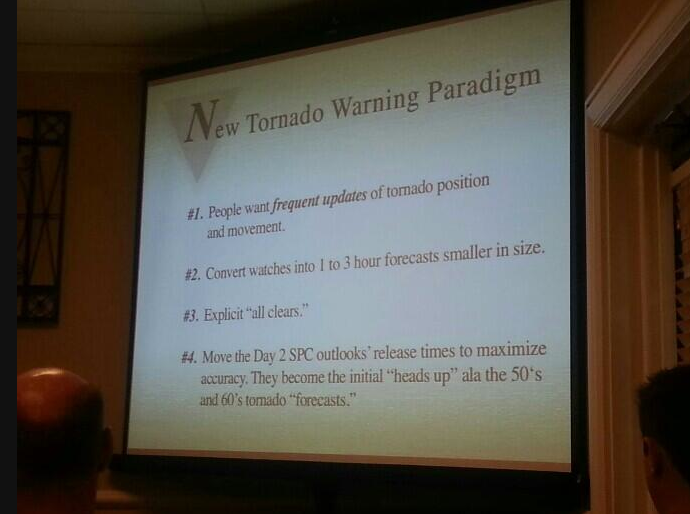 And, especially to Nate Johnson and Ross Janssen for great conferences on storm warnings and broadcast meteorology. Many interesting presentations. 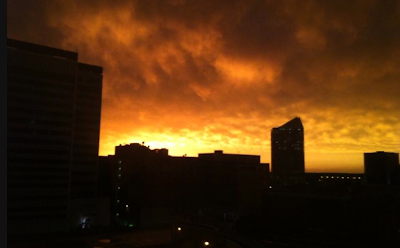 Sunset in Downtown Wichita this evening. Photo by AccuWeather Meteorologist Cory Mottice. Here is another photo of the incredible sunset. 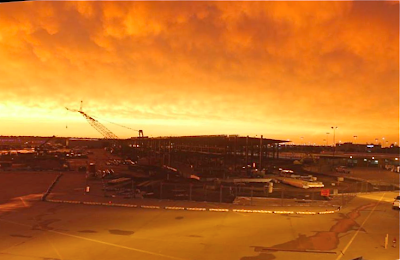 This from Wichita Mid-Continent Airport's camera. In the foreground is the new terminal under construction. Wichita's Mid-Continent Airport clocked a wind gust of 89 mph and McPherson, Kansas, 92 mph. 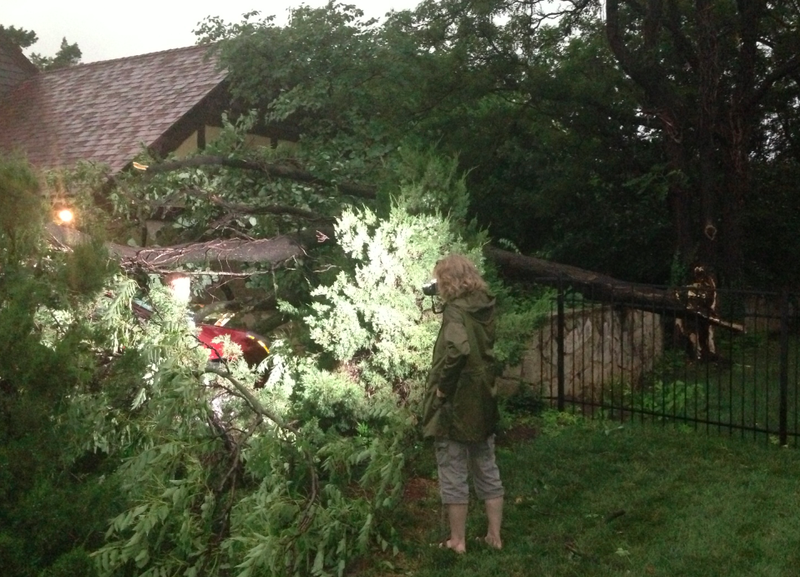 There are north of 24,000 homes and businesses without power in Kansas at the present time. The photo below is of an uprooted tree in Wichita's College Hill area. The tree is laying on an auto. 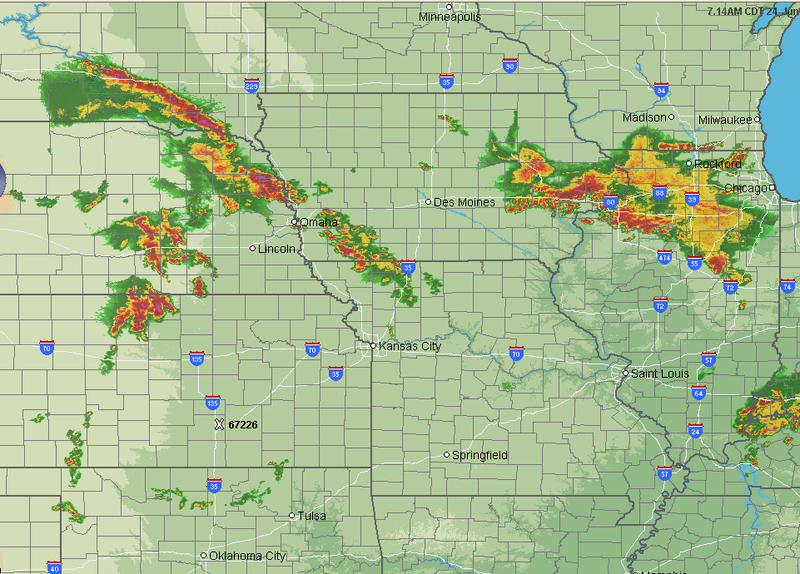 With regard to air traffic, today has been another thunderstorm-driven mess. I've never seen a message like this before. Click to enlarge and you will see that all flights of American Eagle to O'Hare are stopped because of "gridlock." At this moment, there are major delays at O'Hare, Atlanta, Philadelphia, LaGuardia, JFK, San Francisco, Washington-Reagan, and Boston. Plus, after three days of this, there are crews and aircraft out of position, so some of this may last tomorrow even though the thunderstorms will not be in as key locations. There is considerable flooding in Pennsylvania along with a tornado in Boalsburg earlier today. UPDATE: 5:38PM: We now have power outages reported in at least four counties in central Kansas. Almost certainly, those numbers will grow. Here is the severe thunderstorm watch for Kansas until 10pm. There is a chance for a brief tornado or two along with gusts to 90mph and baseball sized hail. Remember: Wind-driven large hail will cause considerable property damage where it occurs along with a risk of serious injury. Ahead of this line, get your car, trampolines, and lawn furniture inside. Power failures may will occur in some areas. At 5:26pm, radar shows storms moving southeast and starting to pick up speed. 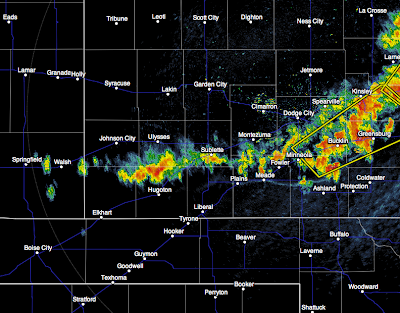 The storms are now moving southeast about 45 mph and may accelerate their forward motion during the evening. 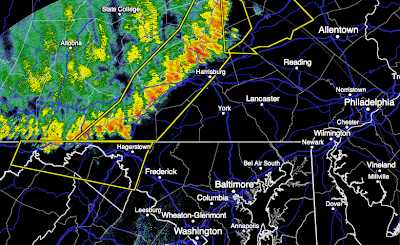 Farther south, the line is rapidly strengthening. 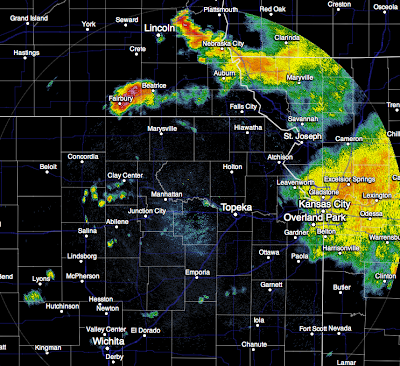 This is the radar at 5:18pm. Storms moving south. A new severe thunderstorm watch has been issued for these storms. Tornadoes are not expected here but 1" hail and gusts to 70 mph are likely. The air over the Central Plains is so unstable, strong thunderstorms could erupt at any time. They will generally move in a northeast to southwest direction. 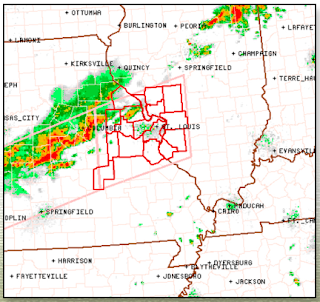 Here is the radar at 1:10pm CDT. Please monitor local weather sources. I am not able to live-blog these storms because I am attending an American Meteorological Society meeting. We already have major weather-related airline delays at all three NYC airports, Boston, Philadelphia and San Francisco. 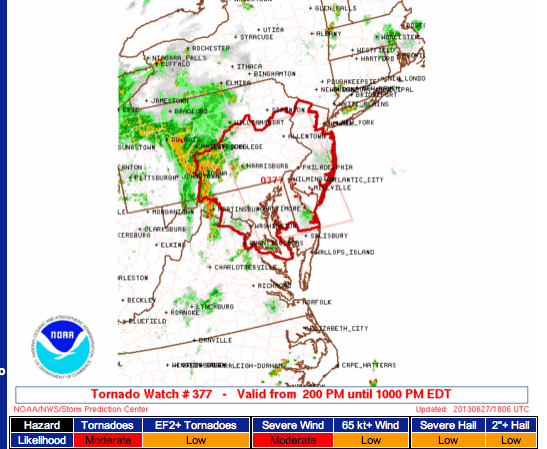 Now, a tornado watch has been issued until 10pm for rapidly developing thunderstorms in the Middle Atlantic States. These storms will further snarl air travel. Keep in mind, thunderstorms are also possible later at Atlanta, Chicago, and Milwaukee -- major airline hubs. This is a day I would suggest checking the "flight status" section of your airline's web site. As with any tornado watch, people in the area should keep an eye on the weather and local weather advisories at the first sign of approaching thunderstorms. Know, in advance, where you will seek safety if a tornado warning is issued. Note: I am at an American Meteorological Society meeting and cannot live-blog the storms. 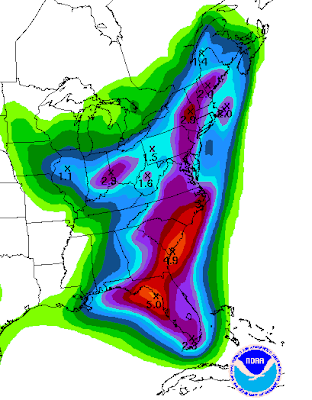 Since I posted the forecasts below, several have been updated by the Storm Prediction Center. 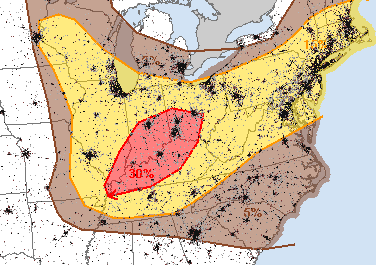 This is the only area with a significant (≥5%) threat. It includes Wichita, Kansas City, Joplin and Topeka. Two areas have been ratcheted up. These are very high numbers and the hatching means gusts of 75 mph or above are possible. So, go ahead and bring trampolines and lawn furniture inside and put your car in the garage. Widespread power failures are quite likely if these winds materialize as forecast. Please prepare for power interruptions! While not as ominous as the Central U.S. threat, thunderstorms with these winds are more than enough to cause scattered power failures and disrupt air travel though the region. 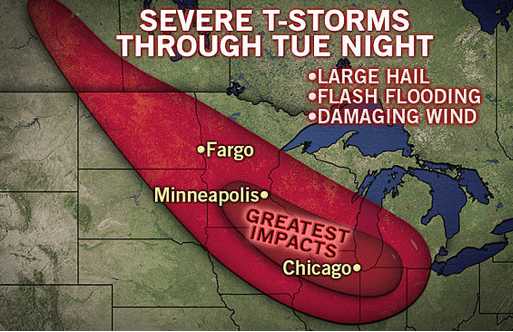 If the winds forecast materialize and drive the hail there will be broken windows, dented cars and damaged roofs. Your car should be in the garage. The significant threshold is 15%. 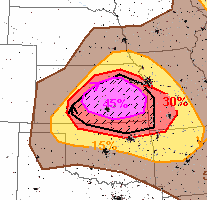 The hatched area is where hail stones larger than 2" are forecast. 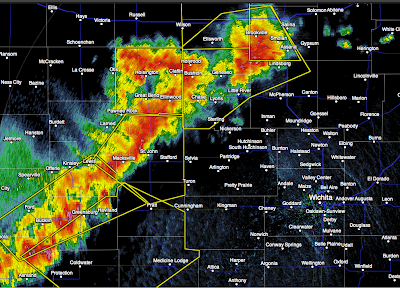 There is the potential for baseball or even larger hail in some areas. 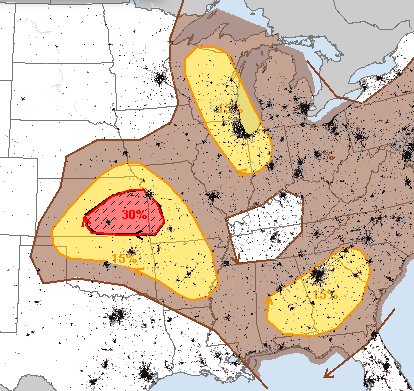 This scenario is more dangerous than the typical mid-summer severe thunderstorm situation. Please plan accordingly. 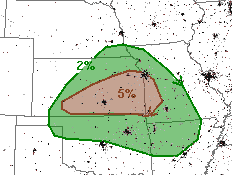 There is one small area where there is a significant (5%) tornado threat. It includes Wichita, Kansas City, Joplin and Topeka. 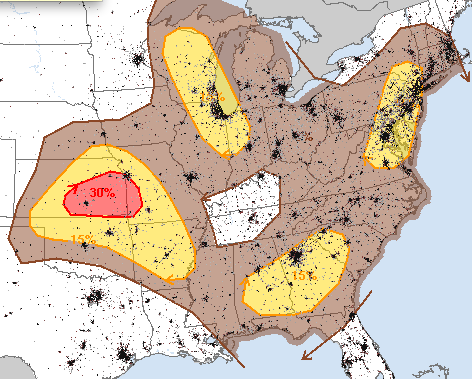 There are multiple areas where a significant (15%) threat of damaging winds exists. Note this includes the airports of NYC, Philly, D.C. and BWI, Chicago and Milwaukee and Atlanta. Could be another bad day for air travel. There are no weather delays anywhere in the U.S. at the moment. 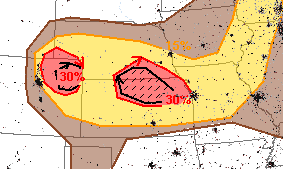 Finally, there are three areas where large (≥1") hail are possible (15% significant threat). 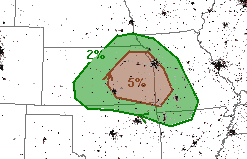 The hatched area is where ≥2 inch hail is forecast. If you live in these areas, please keep up on the weather today. Remember, I'm at the American Meteorological Society meeting (see below) so am not able to routinely update the blog today. You can follow my tweets about the meeting @usweatherexpert or all of the tweets about the meeting by following #ams13. #1) For warnings for the general public, we should aim to provide everyone with 15 minutes of warning for a tornado. Increasingly, research indicates that too much lead time has serious downsides: People start trying to protect possessions, people try to drive away at the last minute, etc. 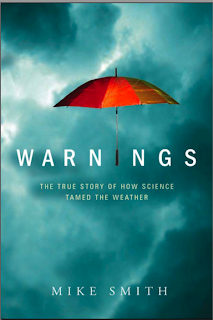 #2) All warnings should have an explicit "all clear." This was impossible in the era when bandwidth was scarce. Now, it can be accomplished relatively easily. People want the reassurance they can come out of the basement, safe room, etc. #3) In before the internet, watches had to be large because teletypes were slow and communications outlets limited. An example of the "too large" watch is below. Some watches run nine hours or more. This is too long. 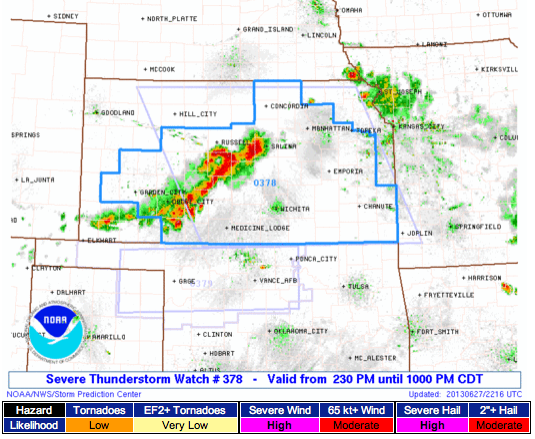 I suggest an area of research known as "warn on forecast" be converted in a new watch strategy: Smaller watches (example below) that are in effect for one to three hours at any given location. With this type of system, people at extreme risk (i.e., those in wheelchairs, untied mobile homes, etc.) would have the option of driving to a place of safety. This is adequate time to protect property (i.e., take valuables into the basement, drive home from after school activities, etc.). #4) I also suggest the Storm Prediction Center issue a new Day 2 Outlook daily at 3:30pm Central time. This could incorporate the European model which would likely increase the accuracy. This would be incorporated into drive-time radio and evening television newscasts and would serve as an important "heads up" for people in the affected area. 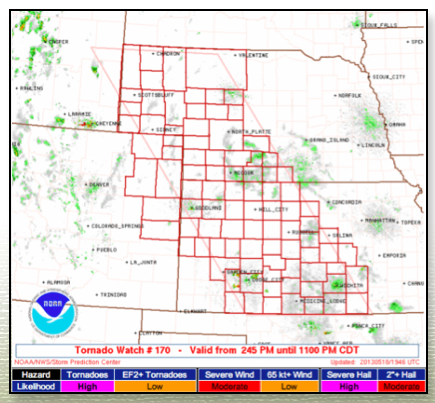 The latest Day 2 Outlook is issued at 12:30pm CDT which is too late for the noon news in the key Central and Eastern time zones of tornado alley. Finally, I presented a video that demonstrates people do not need to be "frightened into shelter." 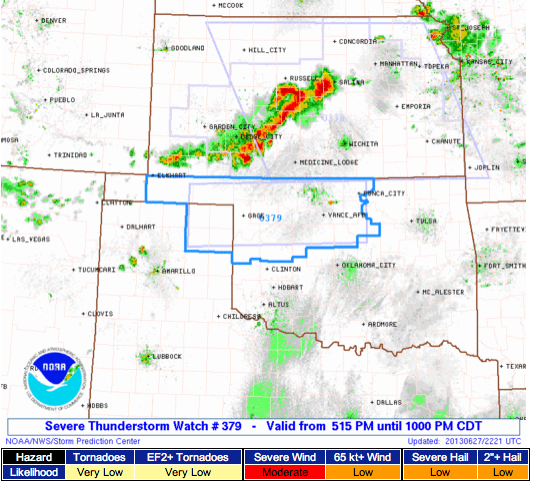 The current NWS Impact-Based Warnings experiment should be discontinued. The video clearly demonstrates that people will do the right things to save their lives if you give them the right information in a timely fashion. 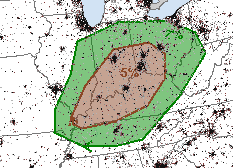 Five percent (brown) is the significant tornado risk and it includes Columbus, Indianapolis, Dayton, Cincinnati, Paducah, and Evansville. Note that this covers the airline hubs from Minneapolis and Chicago all the way to D.C. and Boston. Philadelphia, Baltimore, Washington, D.C., and Dover are all under a severe thunderstorm watch for damaging winds until 1am EDT. 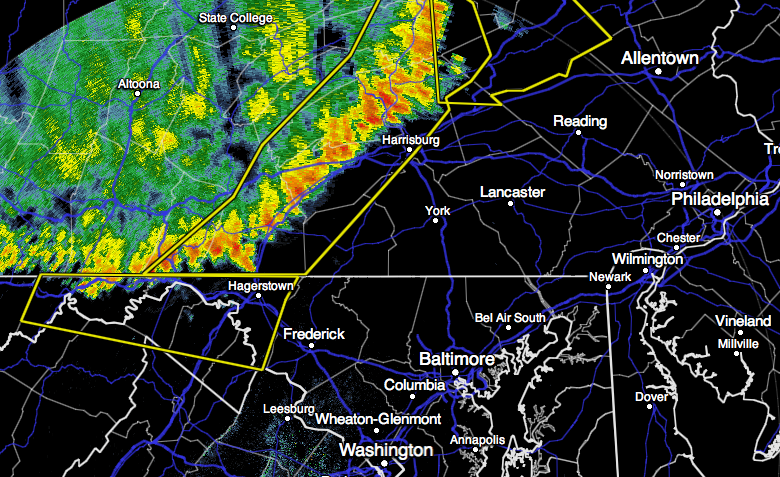 The line of southeast-moving thunderstorms has been knocking trees down across central Pennsylvania. There are media reports that more than 600 flights have been affected at O'Hare. Given this is the second straight day of this, it is more than possible that tomorrow morning's flights will be affected. So, I suggest you go to your airline's "flight status" feature in the morning before you head to the airport. 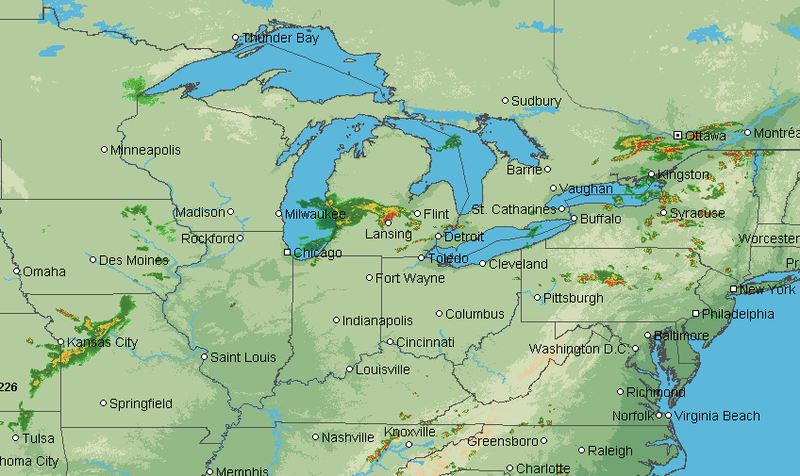 AccuWeather Regional Radar at 12:04pm CDT shows thunderstorms starting to threaten Detroit, becoming more widespread in New York and Pennsylvania, and possibly developing a couple of hours west of Chicago. If you are traveling through the airports listed above or Midway, Detroit, Indianapolis, Cleveland or Minneapolis and haven't boarded yet, you might want to consider a re-route. Here is how with my Airline Crisis Survival Guide. ...and the thunderstorms have just begun to develop. There are currently delays at Los Angeles (LAX), San Francisco, O'Hare, LaGuardia, and Newark. Minneapolis, Chicago, Detroit, Cincinnati, Cleveland, Philadelphia, Boston and all of the NYC airports are at risk. Time to be proactive! Just click here for my Airline Crisis Survival Guide. Going to have a great sky to view flying to the American Meteorological Society meeting. Now, if we can just get the pilot to go down the west side of the line on the first leg to DFW. The hashtag for the meeting is #AMS13 if you would like to follow along. 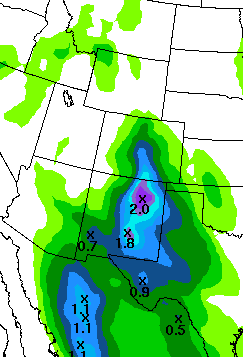 I will, of course, tweet as @usweatherexpert. Another great Kansas farm video. Especially surprising coming from The Economist, a cheerleader of the "world is coming to an end" global warming advocates. The entire article is here. Of course, if the consensus climate models turn out to be falsified just a few years later, average temperature having remained at levels not even admitted to be have been physically possible, the authority of consensus will have been exposed as rather weak. The authority of expert consensus obviously strengthens as the quality of expertise improves, which is why it's quite sensible, as matter of science-based policy-making, to wait for a callow science to improve before taking grand measures on the basis of it's predictions. On numerous occasions, this blog -- on the basis of the lack of warming buying us time -- has advised waiting until the end of 2014 before any decisions about global warming policy are made. That still seems like excellent advice. I chose that date due to some of the forecasts made by those who believe there is a much stronger connection between the sun and the earth's climate than the IPCC. So far, their forecasts are much more accurate than those of mainstream climate science. There are also 15 minute delays at Charlotte. There is one airport notably missing: O'Hare. O'Hare will likely be on the list before sunset. Right now, radar at 4:04pm CDT shows a line of thunderstorms (derecho, actually, but I don't want to get into the definitional argument) heading right for Chicagoland. 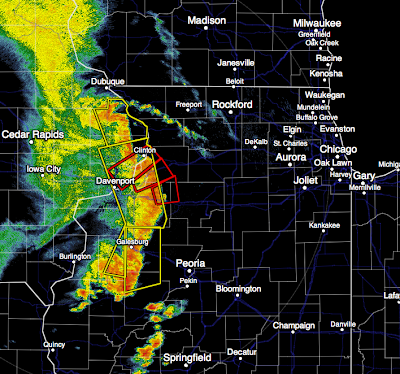 Yes, those are three tornado warnings (red polygons) on the leading edge. If you have a plane change in Chicago this evening (including Midway) and you haven't boarded yet, you might want to look into a reroute. The meeting is in Nashville at the Sheraton Music City Hotel. I'll be speaking about tornado warnings at 3:30pm Wednesday and about global warming at 1:30pm on Thursday. Omaha reported a wind gust of 69 mph at Eppley Field during the past hour. 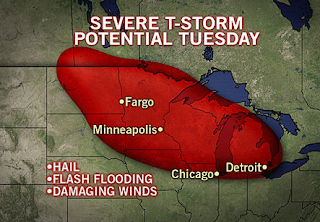 AccuWeather has more on the severe weather threat the rest of today and tomorrow. 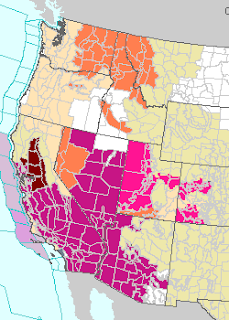 The pink color represents wild fire warnings. The green and maroon in the in the Midwest are flood watches and flash flood warnings. 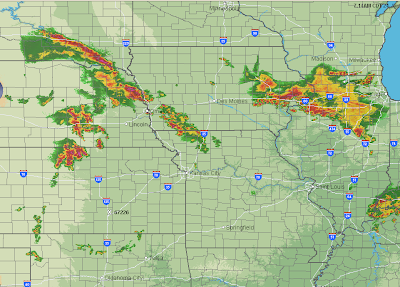 AccuWeather Regional Radar at 7:15am CDT shows multiple areas of showers and thunderstorms. Chicago Midway already has delays and O'Hare will likely have delays by mid-morning. Addition: Sure enough, delays for some flights at O'Hare. Will President Obama Announce He is Turning Off White House Air Conditioning for the Summer? Apparently, the President is going to make an address on global warming Tuesday. Fine, look forward to hearing what he has to say. But, I wonder whether he will set an example by forgoing air conditioning (one example) at the White House or, like so many in the global warming movement, consider that sacrifice is for someone else. A good place to start would be to lower the Presidential carbon footprint by canceling his upcoming vacation to Africa that is estimated by USA Today to cost us $60,000,000 to $1000,000,000. With a south wind and a 93° temperature, conditions are ideal for cutting wheat and that is occurring right now all over south central Kansas. All the reports, formal and informal, that I am receiving is that it is a bumper crop with good test weights. The harvest, at this point, is very much a race against time. 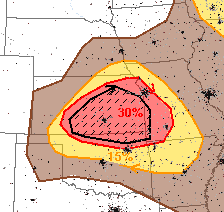 This is a forecast of one inch hail probabilities between now and 7am CDT. Fifteen percent is significant and hatched means the hail could be 2" or larger. Of course, a hailstorm would wipe out an unharvested wheat field. Many of the larger combines (the farm implement that cuts wheat) have large, bright lights so they can cut at least for a time after sunset. 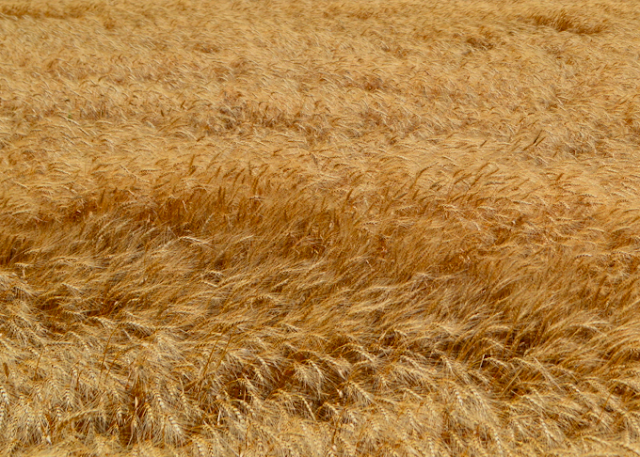 Sometime, just hours can mean a difference between a bountiful harvest and no harvest at all. How Far Can You See Storms in Kansas? 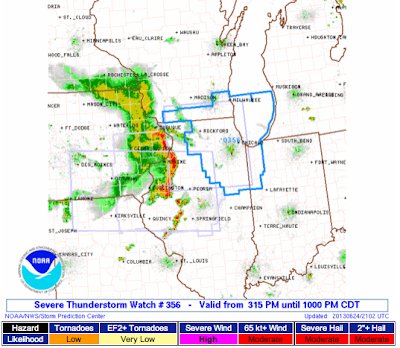 How Good Were the Derecho Forecasts?